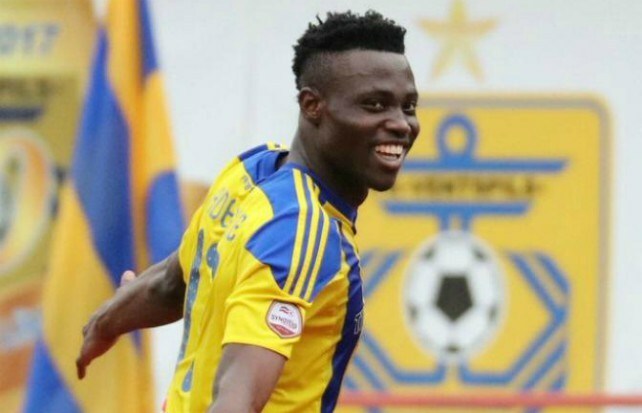 Latvian side FK Ventspils have released a statement expressing their worries over the whereabouts of Nigerian striker Adeleke Akinyemi ‎, who has taken the Europa League by storm this season with seven goals in four games. Adeleke who also has 13 goals in 16 games is on the radar of about 15 clubs in Europe and from all indication, he is set to be called up to the squad of the senior national team of Nigeria for their next game, which is the AFCON 2019 Qualifiers. He won over the coach of the Nigerian team Gernot Rohr who watched him score in Ventspils ‘s loss against Bordeaux, and a chat with the forward and the other two Nigerians at the club after the game further cemented thoughts about his invitation to the Super Eagles. In a statement on their official website, the club lamented his disappearance and warned interested clubs not to go into negotiations with the player or his representatives as he is still tied to the club till the summer of 2020. “We continue to make every effort to find out the location of the attacker Adeleke Akinyemi. We are making serious efforts to find out the reasons that prompted the football player to take such an ill-considered step. At the same time, we once again want to state the following: FC “Ventspils” owns all (100 percent) rights on Adeleke. Therefore, we urge other clubs not to enter into negotiations with the player or his representatives, otherwise, it is a gross violation of all civilized norms and football laws. We also ask other clubs to inform FC “Ventspils” in case if the representatives of Adeleke (or he himself)went out or go out with them to communicate and try to negotiate. FC “Ventspils” respects the existing international standards in the football world with great respect and hopes that everyone will treat our position in this matter with due respect and understanding. Thibaut Courtois Wants Real Madrid Move ?